Joy and I have been talking about Antarctica for a while and we’ve been looking for a way to get there without paying upwards of $10-15K per person. While the experience on a smaller expedition style boat (150-300 passengers) like the Silversea Explorer, Ponant Le Boreal or Seabourn Quest will surely beat the experience on a larger, 2000+ passenger vessel, we found an incredible deal with Celebrity Cruises. 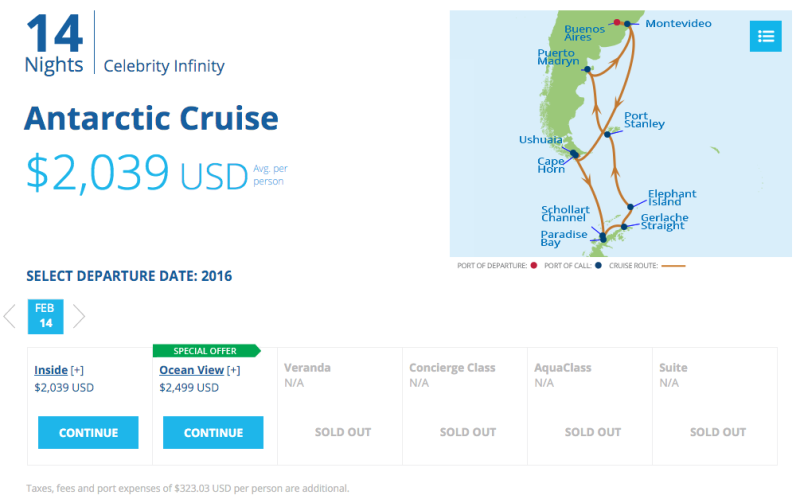 If you’re flexible and can make it to Buenos Aires in the next 2 days for a 2/14/2016 departure, you can snag an Ocean View cabin for $2,499/person. In addition to the great cruise fare itself, the deal comes with $300 onboard credit, a free unlimited drinks package and WiFi. Unfortunately we just got back from a 2.5 week trip to New Zealand in January, so I can’t just disappear again from work for 2+ weeks – but otherwise we’d be en route to Buenos Aires right now!